Let’s consider if you’re new to gardening, both quotes are a meaningful start to a lifetime of gardening pleasure. If you are an ‘old gardener’ I’m sure you’ll agree with both sentiments. You might have inherited an ornamental garden when you moved house, or your own garden is well established. It may appear there’s not much to do but we know otherwise, don’t we? Step outside and consider next year and how you would like the garden to look. 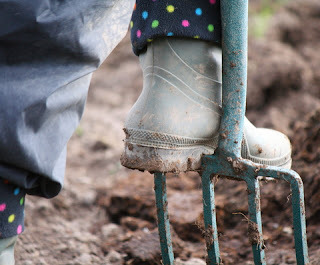 Now is the time to plant new perennials, while the soil is warm and there is more moisture in the air. Dig over borders and add a good load of fertiliser. Plant bulbs in clumps or drifts, to kick off spring with plenty of vibrant colour. They like a feed of bone meal worked into the soil but don’t appreciate a load of animal manure piled on top. Dividing herbaceous perennials will give you more plants to increase your display, as will collecting and sowing seed from perennials and hardy annuals. If you have Pelargoniums and Osteospermums and other tender perennials, take cuttings and grow them on a windowsill if you don’t have a heated greenhouse. The same goes for fuschia plants and others such as gazanias you want to keep for next year. Bring them indoors and keep them in a warm conservatory or on a kitchen windowsill. And whether you’re new to gardening or fully green-fingered, next year you’ll appreciate the sowings you made now of hardy annuals: alyssum, Calendula, candytuft, clarkia, coreopsis, godetia, larkspur, Shirley poppies....whatever you sow, enjoy.